Beach Weddings are beautiful and classic, and there is something very romantic about exchanging your vows outdoors at sunset with the sound of the waves crashing in the background. 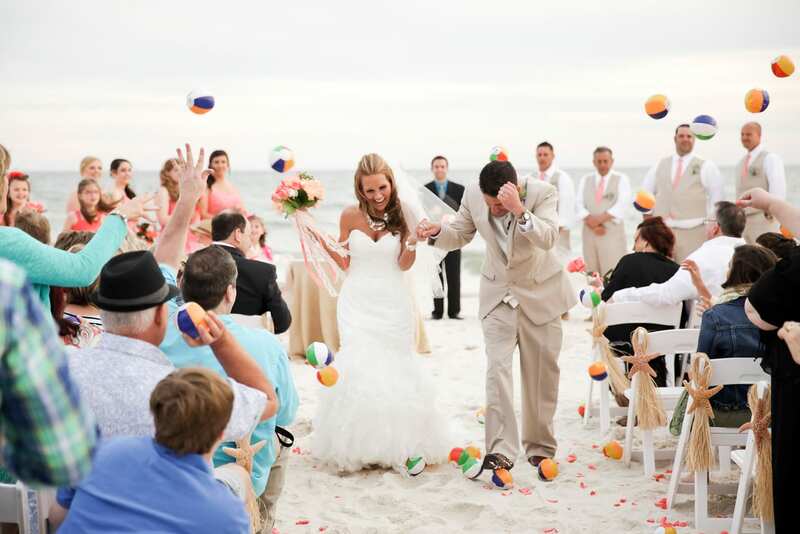 Here are some tips to help you plan a beautiful beach wedding. If you are not sure where to start, consider booking the vendors that can only do one event/wedding per day, such as your photographer, your band or DJ, and in many cases, your venue. A florist and pastry chef can prepare for multiple weddings at one time, but you need to book the people who have to be present on the day of your wedding first. vendors in the area and can assist you in finding the perfect partnerships. Do You Need a Beach Permit? You will need to check with your venue to see if a beach permit is required. Some locations require a permit from the city, and you wouldn’t want to show up on wedding day with another bride and groom saying “I do” in your spot. You should also find out whether your beach of choice is a public beach or private beach. During peak summer months, it’s not uncommon to have two weddings within view of each other on public beaches. There are some resorts, such as The Beach Club, who have private beaches and can guarantee you won’t have other weddings or umbrellas and chairs in background of your wedding pictures. Although it is your day, always remember to consider your guests when planning your wedding. Do you want chairs for everyone in attendance? Do you have any elderly relatives who might have trouble walking in the sand? If so, find a venue where you can have the beach view and feel, but not necessarily have to be in the sand. Waves are crashing on the shore can provide calming background noise, but they can also be too noisy depending on the weather. You may want to consider booking a wireless sound system through your DJ or venue so that your guests can hear your vows. Also, consider finding a place that can host both your ceremony and reception. This allows your guests to start celebrating right away, and makes it easier for you to finish pictures and not feel too far from party. Driving 30-45 minutes in tourist traffic after the ceremony to the reception can be stressful and inconvenient. It’s also a big convenience for a destination wedding and reception to be booked in a place where your guests can take the elevator home and not have to travel after the reception. There are several locations in the Gulf Shores/Orange Beach area that can assist you in planning your ceremony and reception as well as provide discounts for your guests to stay onsite and keep the celebration alive all weekend. Some of your guests may even want to take the opportunity to extend their stay and enjoy a family vacation. Most importantly, when planning an outdoor wedding of any kind you must have a back-up plan in case of inclement weather. Whether it is a tent on standby with a rental company or an alternate indoor space, preparation is a much better alternative than hoping for the best. With the proper planning and preparation, you will be able to relax and enjoy your special day.